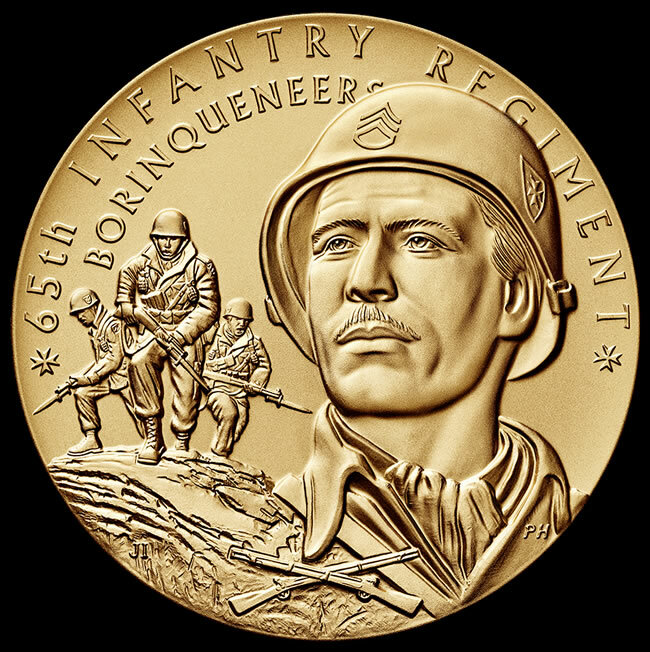 The 65th Infantry Regiment, known as the Borinqueneers, was collectively awarded the Congressional Gold medal Wednesday, April 13, at a ceremony held in Emancipation Hall in the U.S. Capitol Visitor Center. The United States Mint struck the Congressional Gold Medal for the 65th Infantry Regiment. As mandated by law and shown above, it also strikes bronze versions and sells them to the public. Composed primarily of Puerto Ricans, the U.S. Army 65th Infantry Regiment was the last segregated unit of the U.S. military. Though restricted to noncombat roles during World War I, the regiment served heroically on the battlefields of World War II and Korea, participating in some of the fiercest battles. In Korea alone, soldiers in the regiment earned one Medal of Honor, 9 Distinguished Service Crosses, approximately 250 Silver Stars, over 600 Bronze Stars, and more than 2,700 Purple Hearts. Shown on the obverse of the gold medal is a depiction of a fictional Borinqueneer staff sergeant. In the background are three soldiers in an inverted “V” formation, taking the high ground with fixed bayonets during an assault on the enemy during the Korean War. The foreground offers the crossed rifles insignia. Inscriptions above the scene read, 65th INFANTRY REGIMENT and BORINQUENEERS. The design was created by United States Mint Artistic Infusion Program (AIP) Designer Joel Iskowitz and sculpted by United States Mint Sculptor-Engraver Phebe Hemphill. The medal’s reverse depicts the Castillo de San Felipe del Morro of San Juan, Puerto Rico. It is a 16th-century citadel, a central symbol of Puerto Rico, and the preferred military command ceremonial parade site of the 65th Infantry Regiment. 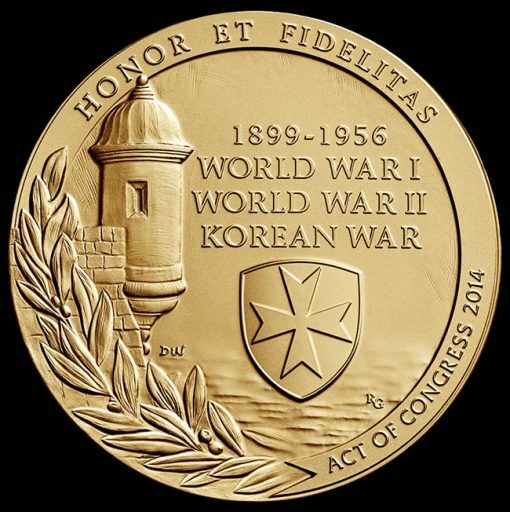 Inscriptions around the design include HONOR ET FIDELITAS, 1899-1956, WORLD WAR I, WORLD WAR II, KOREAN WAR, and ACT OF CONGRESS 2014. The image was designed by AIP Designer Donna Weaver and sculpted by United States Mint Sculptor-Engraver Renata Gordon. The medal was authorized under Public Law 113-120, which was enacted when President Obama signed the legislation on June 10, 2014. Bronze replicas of the gold medal were authorized by Congress and are available from the United States Mint. Three-inch replicas may be ordered for $39.95 with 1.5-inch medals available for $6.95. Orders are accepted online at catalog.usmint.gov or by calling 1-800-USA-MINT (872-6468). I was so glad to order these medals today when they were first offered for sale at 3pm Eastern time. I have waited almost 2 years for the bronze versions to give one to my best friend from junior high school who is Puerto Rican ( along with his 11 brothers & sisters) & his father fought in the Korean War as a Borinqueneer. His father passed away years ago, but this medal will be a nice gift for my best friend & his family members. Thanks for those who served in this historic regiment over many years! That is a most marvelous thing you are doing Seth. I’m sure that your best friend, and his family, will appreciate your gift. So what does that mean, “collectively awarded”? I’m sure there are surviving WWII and Korean War members still alive. Did each one receive a gold medal? I do appreciate all the war service coins dedicated to those who fought for our freedoms. When Congress awards an official gold medal it is stated in the legislation that it goes to one person in specific (or if they have passed on to a family member) or to a group of people (only 1 medal) “collectively.” These medals are 3-inch diameter & are actual solid gold & therefore expensive to make just one. Most medals awarded “collectively” wind up in museums. The Rev. Dr. Martin Luther King Jr. & Coretta Scott King medal was awarded by Congress in 2004 & was struck, but due to family fighting over it (ironically) it was not awarded till 10 years later in 2014 with the legal provision that it will be permanently displayed at the Smithsonian’s new museum of African-American History. If I remember right, these medals cost the gogovernment about $15,000 each to produce (all are struck at the Philadelphia Mint). I see, Thanks for the info. Seth. I recall not so long ago wasn’t there some gold Indian coins distributed to some Tribe members? If my recollection is right? So they make this gold medal, and it winds up in some possible Government run museum. Well at least they are honoring some people of valor. The “gold Indian coins” you might be referring to were Congressional Gold Medals honoring the various tribes whose service members helped America during the two world wars by being “code talkers.” Specifically, they were soldiers who used their knowledge of their respective Native American language as a basis to transmit coded messages. It was determined that the languages were so unique that the Japanese would not be able to break the code that was set up. Starting with the Navajo, there have been more than 30 tribes (and still counting as research continues) who have been honored with a CGM over the past several years. 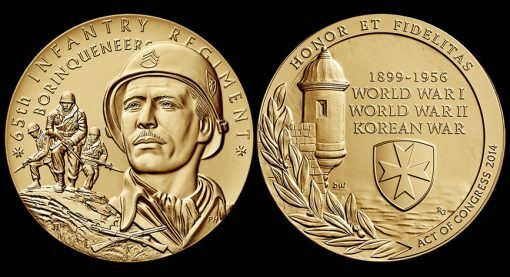 I should also add that, in addition to the gold medals, Congress awarded each surviving code-talker soldier (or representative members of his family) a solid silver medal of the same design. Pretty cool way for a nation showing its gratitude to certain heroic citizens of our country who were otherwise ignored and discriminated against. Robert, That’s right. It was the code talkers. I really like the series of bronze coins the Mint has on those. I wish they made those in silver for distribution to the general public.